The USS Oklahoma sank during the invasion of Pearl Harbor Dec, 7, 1941. Challis James of New Boston lost his life in this attack. December 7, 1941 will remain in the history books as the day the Japanese brought the United States into World War II. Seaman Second Class Challis Rudolph James, an 18 year old from New Boston lost his life while aboard the USS Oklahoma on this day. Included in the list of identified sailors was James. According to family members, his body has not been brought back for a proper funeral as of today. An interview with family members is to take place and a complete story from that conversation will appear in the Daily Times in the near future. The Daily Times will also cover the ceremony when James is returned to the family here. 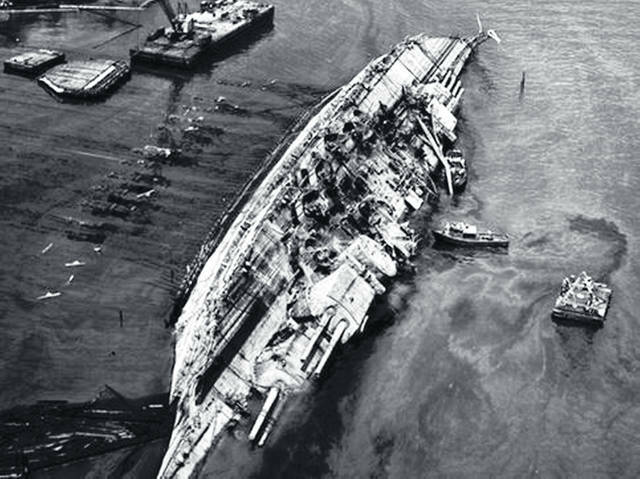 https://www.portsmouth-dailytimes.com/wp-content/uploads/sites/28/2018/12/web1_Oklahoma.jpgThe USS Oklahoma sank during the invasion of Pearl Harbor Dec, 7, 1941. Challis James of New Boston lost his life in this attack.